So K2 Lunatique use to be called the Luna when it was camber but now with the name change came a new “all terrain rocker” shape we call flat/rocker. The board is flat a bit past the bindings and then rockers up a little sooner than their flatline tech, jib rocker tech and catch free tech. 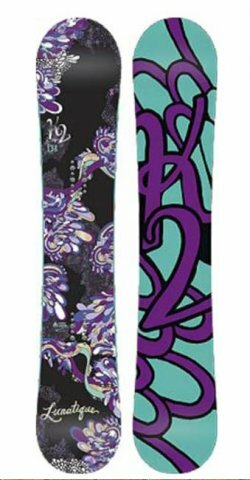 We have to admitt that the K2 Lunatique does have an all conditions ride that offers catch free stability and float in powder. The pop is not completely lifeless but it doesn’t compare to some continuous rocker and hybrid rocker boards. Powder and jibability are a lot better with the new 2011 & 2012 shape. So if you can deal with lesser pop you’ll get a lot more when it comes to stability, powder and jibbing. The flat/rocker Lunatique is not as fun when it comes to carving but it’s still pretty fun. This is a great do anything board and one of the best in it’s price range. We are big fans of K2’s All terrain rocker and think it’s one of the better flat/rocker designs out there. The K2 Lunatique Snowboard has an excellent price point and a very good reputation. Despite that there were no expectations on our end for how this board rides. All we can say is this is one of the better rocker boards in this price range. 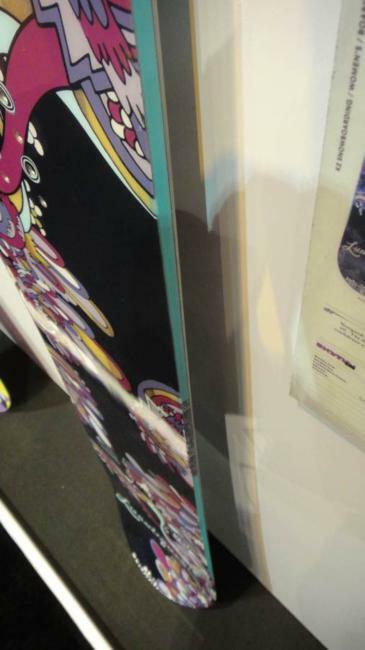 It’s right up there as one of our favorite flat/rocker snowboards in the Sub $400 range. 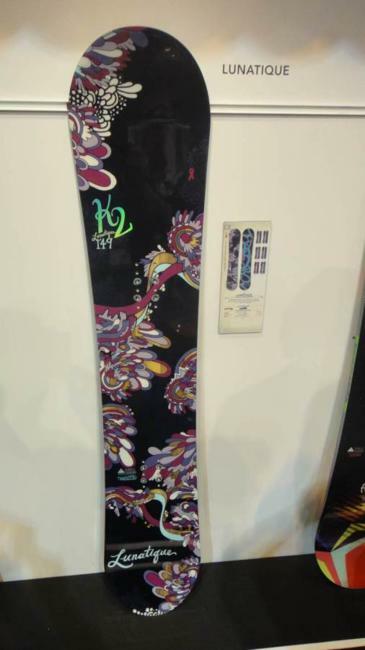 Groomers– The K2 Lunatique is a good cruiser. It’s great for someone to learn how to address the varying conditions that groomers can have at low to moderate speeds. It’s not going to be like a directional camber board but it’s a stable ride that doesnt’ get squirrely getting of the chair on one foot or flat basing across hard flat snow. Powder: It has pretty good float and planes very well. The directional twin with a setback stance combined with a flat/rocker technology makes for a good ride when it snows. Turn Initiataion/Carving– The Lunatique is very easy to turn but it’s not like those rocker or hybrid rocker boards that have a bend in the middle. Some look for that ultra loose ride in an all mountain board but others like a little more stability between the feet. With the Flat between the feet and the rocker after the Lunatique had a very smooth predictable ride. We both had a lot of fun making short or long turns. When it came to laying down a hard carve the Lunatique did a great job. Extending the Flat camber a bit beyond the bindings with some rocker after makes for a fun carve. Speed: Well we didn’t expect much in the speed category here and our expectations were correct. The soft flex and extruded base doesn’t make for a bomber ride but it’s fun to cruise with this board. That is good for most beginner to intermediate riders and in this situation the extruded base is a good call because it is easier to maintain for an entry level rider. Weight– Light but not a featherweight. The Lunatique is not heavy enough for us to notice it on a chair. Pretty light for a board of this price range while still feeling sturdy. Edge Hold: The edge hold isn’t bad but we’d like to see some sort of extension of the edges. If you ride in hard to icy conditions this might not be the best board but if you ride in average to good conditions this will be just fine. Flex: Pretty soft and playful. Super easy to butter or learn new tricks on. Switch: If you want to learn how to ride switch you need a twin. Also you need a board that is easy and predictable to turn. The K2 Lunatique is a perfect board for people who want to get better riding switch or people who want to learn. Jibbing/Rails– The Lunatique was really fun and catch free. It’s also soft enough to hit some semi technical rails but not a specialist. You are better on boxes and more mellow jib’s. Jumps/Pop– It’s not super poppy but the Lunatique was fun to generate your own air over little obstacles around the mountain. If you are looking for fun on small to medium kickers the K2 Lunatique will do a good job. All in all we were very impressed with the K2 Lunatique. We found it to be a great board for a rider looking to discover snowboarding. We try to get as many images of the K2 Lunatique, but forgive us if they're not all there.